National Institute of Health is one of the most prestigious institutions of the country involved in multi disciplinary public health related activities like diagnostic services, research and production of various vaccines for over 40 years. The idea of establishing a National Health Center (NHC) was conceived in early 1960’s, which started functioning in 1965 at Islamabad. Directorate of Nutrition Survey and some other health related research organizations were shifted to NHC. Later on, all these independently working departments were integrated and designated as National Health Laboratories (NHL – Islamabad). The institute is a WHO collaborating center for viral diagnostics and regional reference laboratory for polio, in addition to being a national reference center for diagnosis of Influenza. It also works as the National Appellate Laboratory for quality control of drugs and is the public analyst laboratory for the quality control of food for the federal territory, Islamabad. 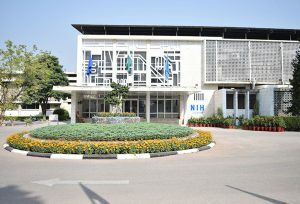 NIH also conducts numerous international, regional and national seminars, symposia and other related activities.